Happy Vinayaka Chavithi, Ganesh Chathurdhi, Pillayar Chathurdhi to everyone who is celebrating this festival today! 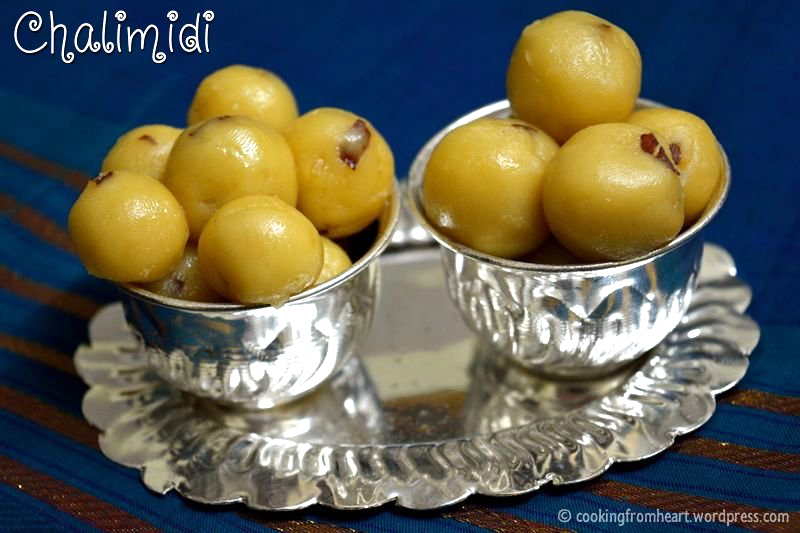 🙂 I am posting the last recipe of this festive series – Chalimidi. 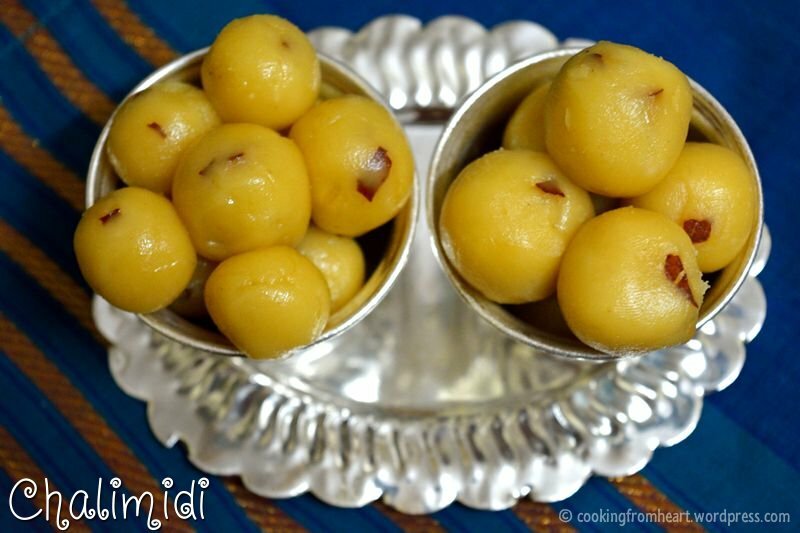 This is a popular festive sweet recipe from Andhra that uses rice flour and jaggery. 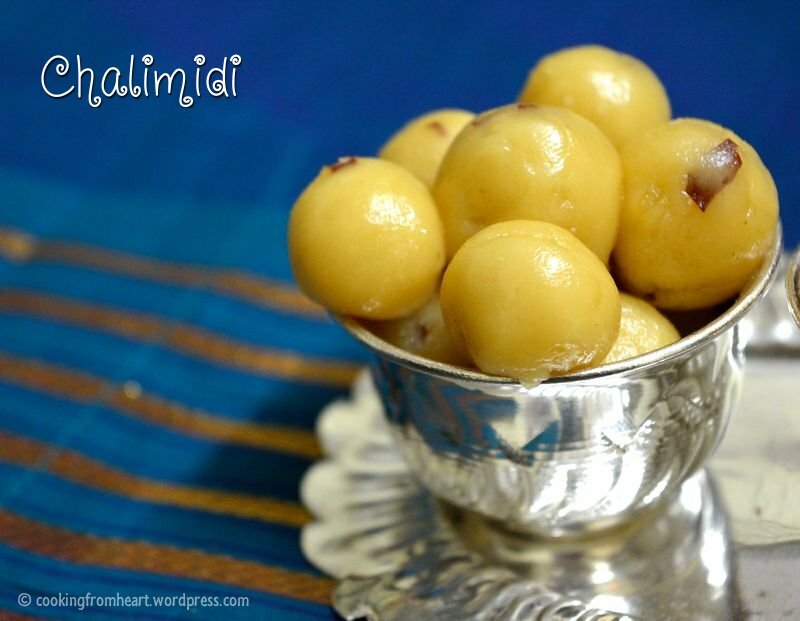 This again is a favorite sweet for the Elephant God Ganesha and hence is a must for us during this festival. There are different ways this is usually done and today I am posting the recipe that is an absolute favorite of mine. 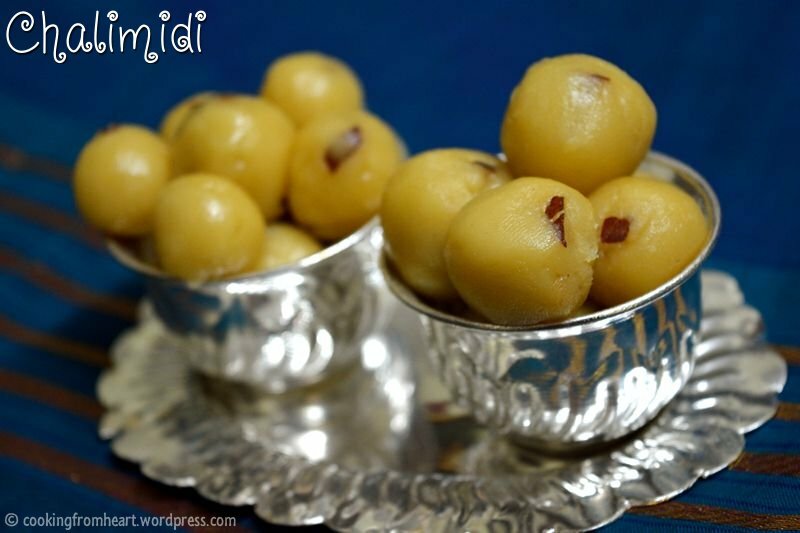 There is Pacchi Chalimidi which also uses rice flour and jaggery but it is not cooked and can be made instantly – hence the name Pacchi (raw) Chalimidi. In this recipe however, jaggery is melted to form a thick syrup and then the rice flour is cooked in the hot jaggery syrup to make a candied sweet that is soft, silky, melt in mouth. This is such an energy booster too – jaggery has high iron content and good for your health unlike the white sugar which is just the empty calories. 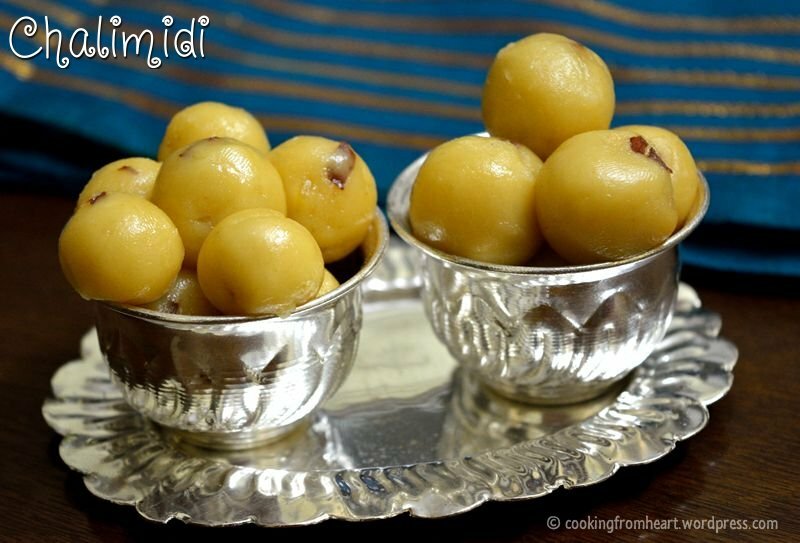 I usually pop-in a small ball of chalimidi and I get instant energy. Preparing the rice flour is slightly different from the way the rice flour is prepared for the other recipes I have posted. Raw rice is soaked overnight in enough water. The rice is then drained of the water completely in a colander and left for 30mins. Alternatively, the soaked rice can be spread on a cotton cloth so that the excess water is absorbed. The rice has to be blended in a mixer jar (while its wet but not with water) and made into a fine powder. The powder has to be sieved and only the fine powder is used in the making of this recipe. Unlike the other rice flours, this one cant be made in advance or stored for using later. Once the rice flour is made, preparing this sweet is super simple. Infact, it takes only 5-10mins at the maximum 🙂 I am glad my parents are with us for this year’s Vinayaka Chavithi and hence I got to take step by step pictures of this Special Andhra delicacy Chalimidi. 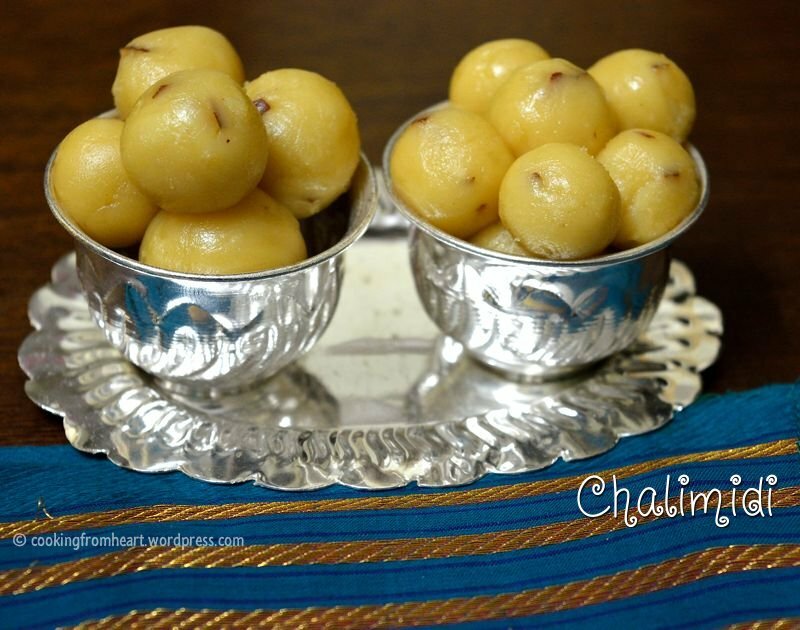 Check out my other Vinayaka Chathurdhi Recipes – Sojjappalu, Mookakadai Sundal and Paal Kozhukattai. Soak Rice in enough water for atleast 8 hours. Drain the excess water and spread the rice on a cotton cloth for 20mins until all the excess water is absorbed but the rice should be still wet. In a blender, make this rice into a smooth powder and sieve only the finest powder. The powder made would be a little moist. Set aside. 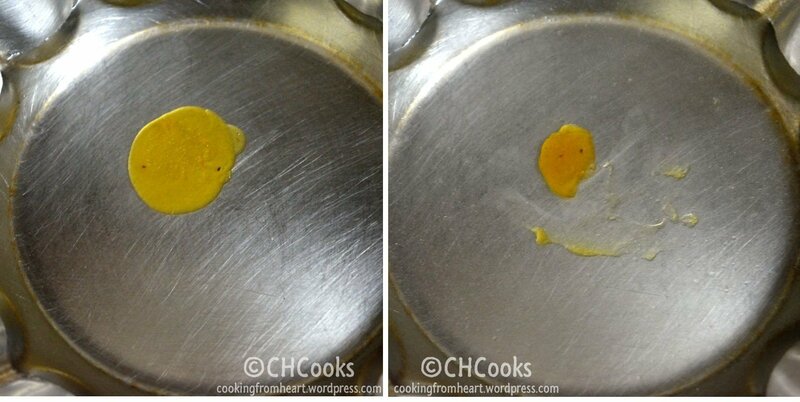 In a thick bottomed pan, heat ghee/clarified butter. Add finely chopped coconut pieces. If using, cashews can be fried until golden brown. Taken them out onto a bowl. 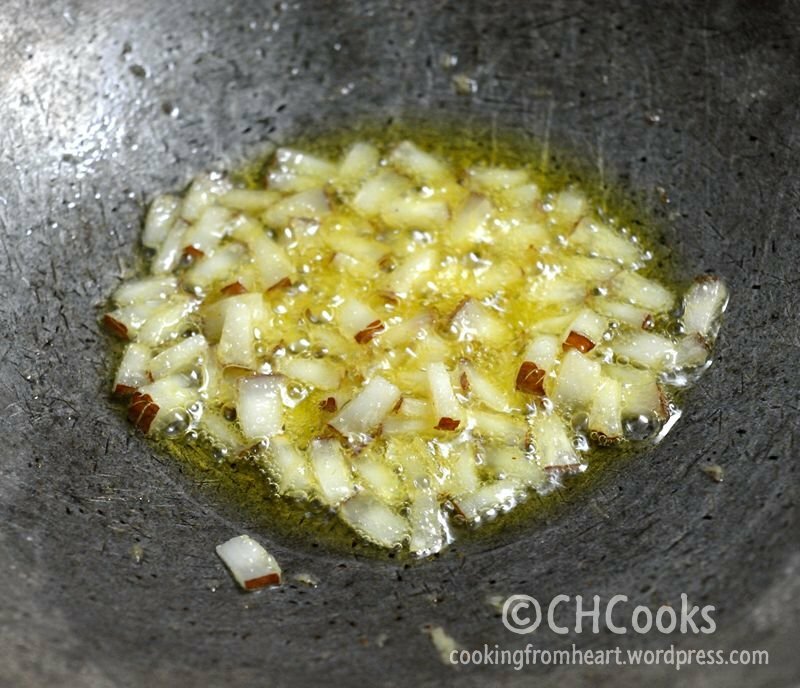 In the same pan, add the grated jaggery and set the flame on low. Add two tbsp of water. Soon the jaggery would form a thick syrup. When a drop of the syrup is dropped into a bowl of water and rolled, it should form a perfect ball. That’s the right consistency for the syrup. Add crushed cardamom powder. Add rice flour and quickly stir well. Soon Chalimidi would come together and becomes thick. Switch off the heat. Add the fried coconut pieces and cashews. Mix well. Let the Chalimidi stay for 5-10mins and it would thicken further. It can then be rolled into balls of any size. This stays good for atleast a week. Offer as Neivedhyam for Ganesh Chathurdhi and serve immediately. It’s a really good snack/dessert otherwise. Getting the rice flour consistency right is very essential for the preparation of this dish. The finer the rice flour, the better the Chalimidi. Otherwise, it can taste grainy. The consistency of the jaggery syrup is essential in thickening the chalimidi after adding the rice flour. The jaggery when dropped into water should form a perfect ball and not be runny. Usually the proportion of the rice flour to the jaggery is 1:1. Do not add more than 2 tbsp of water while making jaggery syrup. Additionally, roasted, de-skinned peanuts can be added to this too. Instead of fresh coconut, finely chopped copra or dried coconut can be used too. 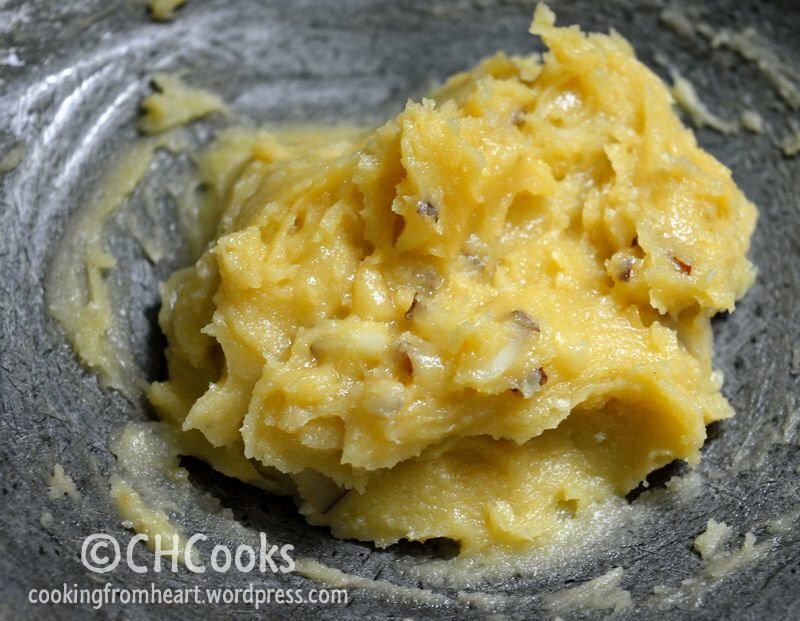 I totally love this…jaggery always makes everything better in a sweet…gonna try this soon? Happy Ganesha Chavithi. I think we call this as thambittu in kannada.. i use the store bought rice flour n add add the jaggery syrup. 😉 great u did it from scratch. love your very unique recipes and your pictures are so amazing! Looks yummy.. 🙂 happy ganesh chathurthi.. Thank you Jo 🙂 Wish you the same!